Washington, DC, September 21, 2018 — The Elliott School of International Affairs’ Sigur Center for Asian Studies, the GW Institute for Korean Studies (GWIKS) and the Institute for Middle East Studies (IMES) have been awarded approximately $3 million in grant funding under the U.S. Department of Education’s prestigious Title VI program over the four-year life of the grant. The Sigur Center and Institute of Korean Studies together received the highly regarded designation of National Resource Center (NRC) for Asian Studies. The designation – the first time these two centers have received NRC status – enhances the institutes’ ability to engage the broader public community, including students, K-12 educators, HBCUs, policymakers, military veterans, journalists and the general public on regional and global issues of importance. With this award, GW joins a handful of other world-leading universities, including Stanford, Columbia and the University of Chicago, which have likewise been recognized with this honor. Additionally, the Sigur Center, GWIKS and IMES have been awarded over 90 Foreign Language and Area Studies (FLAS) Fellowships which support undergraduate and graduate students studying modern foreign languages and related area or international studies. The awards will provide fellowships to 24 GW students in the first year. 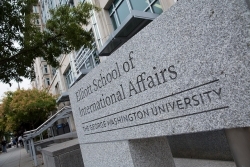 The George Washington University’s Elliott School of International Affairs is one of the world’s leading schools of international affairs in the United States. Located in the heart of Washington, DC, its mission is to educate the next generation of international leaders, conduct research that advances understanding of important global issues, and engage the policy community in the United States and around the world. In the February 2018 issue of Foreign Policy, the Elliott School of International Affairs’ undergraduate and master’s programs were ranked among the top ten international affairs programs in the United States by the Teaching, Research, and International Policy (TRIP) survey. The Sigur Center for Asian Studies is a university research institute and the academic home of the Asian Studies Program of the Elliott School of International Affairs at The George Washington University. Its mission is to increase the quality and broaden the scope of scholarly research and publication on Asia, promote US-Asian scholarly interaction and educate a new generation of students, scholars, analysts, and policymakers. The Institute for Middle East Studies was founded in 2007 as part of a broad, University-wide initiative to support academic work on the Middle East. IMES faculty associates represent a breadth of disciplines from political science to media and public affairs to religion to international business. IMES faculty represent a breadth of disciplines from political science and history to anthropology, art history, and media and public affairs.